In beautiful portraits of dignity and joy, photographer Wyatt Gallery shows us the reality of Haitian living nearly a year after what is arguably the worst natural disaster in modern history, the devastating January 12, 2010 earthquake. An exhibition of Wyatt Gallery’s photography will display at the Umbrage Gallery in DUMBO from January 6th through March 31st 2011. Of the 1.5 million Haitians who lost their homes in the 7.9 magnitude earthquake, the majority still live in makeshift tent cities, and the promised billions in foreign aid have yet to materialize. While peacekeepers and aid donors have budgets that overshadow the Haitian government’s, a lack of coordination in their efforts has hampered the country’s recovery efforts. 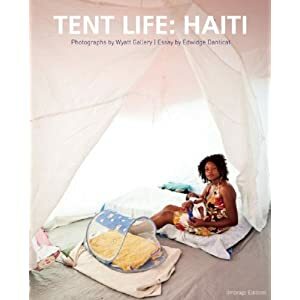 Wyatt Gallery’s photography beautifully illustrates and narrates the lives of a people in recovery, but it does not romanticize the tent cities or the living conditions of the Haitians rendered homeless by the earthquake. Tent Life: Haiti calls for a renewal in global attention and aid, while focusing on the resilient spirit of the people most affected by the disaster. Arriving in Haiti in the tumultuous aftermath of the 2010 earthquake, Wyatt Gallery photographed the tent communities that are now synonymous with the areas surrounding Port-au-Prince, Haiti. While their homes have been destroyed, Gallery’s subjects remain hopeful and resilient within the larger context of housing and water issues that challenge their country today. All royalties from the book go towards Healing Haiti and other Haitian charities.